I can still remember those halcyon days when I had the time to watch anime streamed online. Actually, I made the time, back when a fair fraction of anime used to be released on DVD, and streamed anime looked just as good, if not better. 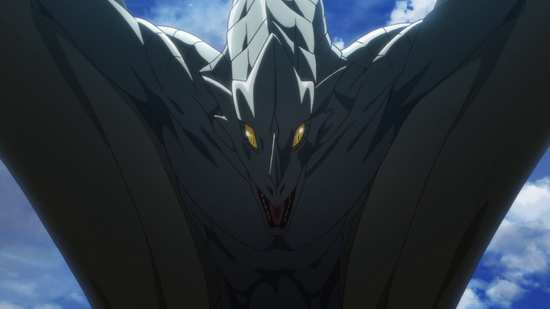 These days, it’s the rare anime that gets a DVD release, and if you had a choice between watching Blu-rays, shiny, shiny, pristine Blu-rays, and opting for the iffiness of your internet connection, well the choice practically makes itself. This does have the downside that I’m back where I was when I started reviewing anime on DVD; woefully behind the times. The only way I have now of knowing which anime is trending, which shows people are raving about, is to see what’s being talked about on anime forums, what’s the latest meme, and what screenshots are prevalent. 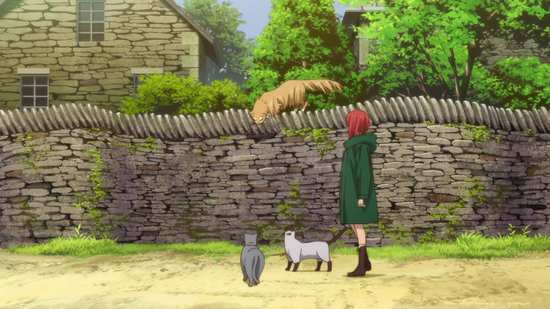 A year or so ago, everyone was talking about The Ancient Magus’ Bride. It was everywhere, especially the screen shots of the cute little red-haired girl and the long faced Skeletor. I guess Manga Entertainment really scored when they got the licence to this show, and I finally get to see what all the fuss is about. 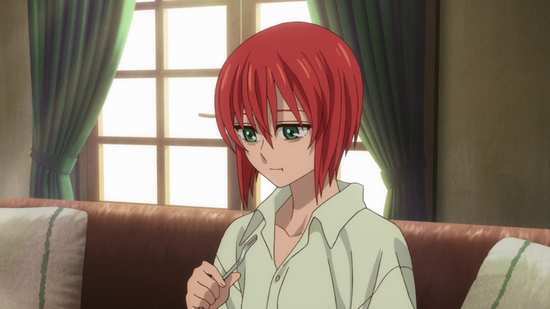 Someone signing a contract isn’t a rarity, but Chise Hatori is actually signing her life away. Once her name is on the dotted line, she’s fitted with an iron collar and a chain, and led to the auction block. She has reason enough to think her life is worthless, having been shunned all her life, but there’s a lot of interest in her during the auction. She’s worth something to someone, and more to the mysterious masked figure of Elias Ainsworth, who makes a grand entrance to make his new purchase. 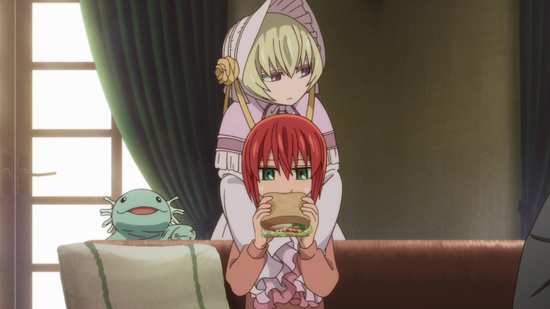 It seems that Chise has lucked out and been bought by a considerate owner. Elias is a mage, an ancient practitioner of magic who has an animal skull where his head should be. 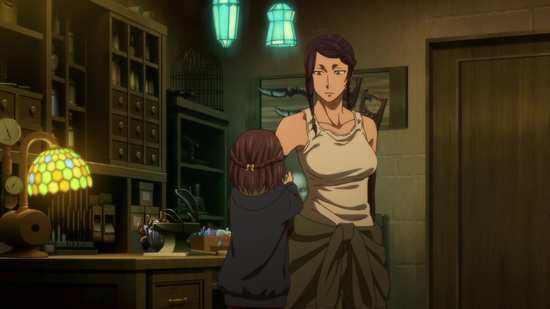 Chise is a Sleigh Beggy, a rare and much coveted item in the magic world, but it also means that rather than being property, Chise has the innate power that will make her Elias’ ideal apprentice. But becoming a mage in a world where the mages are an endangered species might not be a good idea. And on top of that, Elias has plans to make Chise his bride. 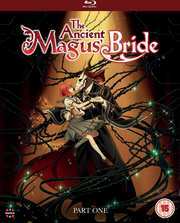 The first twelve episodes of The Ancient Magus’ Bride are presented across 2 Blu-rays from Manga Entertainment as follows. 3. The balance distinguishes not between lead and gold. The Ancient Magus’ Bride gets a 1.78:1 widescreen 1080p transfer on this disc, of a Production IG animation. The image is clear and sharp, colours are strong and consistent, and the presentation is solid. Signs of compression and aliasing are absent, and digital banding is rare. Then I put disc 2 in, and there was banding all over the place. It’s odd, as content-wise, there is more on disc 1 to compress than there is on disc 2. Production IG deliver the goods when it comes to this fantasy animation, wonderfully detailed, rich with imagination, and taking a page from Studio Ghibli when it comes to realising these magical characters and creatures .It’s a fine animation almost done justice by this Blu-ray release. The audio is presented in Dolby TrueHD 5.1 Surround English and 2.0 Stereo Japanese with subtitles and signs locked during playback. When the discs are inserted, you’ll get a disclaimer mentioning that the songs remain in Japanese in both versions, as Funimation respects the creator’s original intent. The Japanese audio was fine for my purposes, the characters cast well, and the moments of action coming across robustly in the stereo format. The dialogue is clear throughout, and the subtitles are timed accurately and free of typos. The discs present their content with animated menus. Disc 1 autoplays with a trailer for Funimation Now. It also has the OVA episodes, The Ancient Magus’ Bride: Those Awaiting a Star, three episodes presented in Japanese only, running to 75:51. These relate a story from Chise’s childhood. Disc 2 has more than the usual extras as well, with Funimation offering a Twitter Q&A with the ADR Director and lead voice actors answering questions. This lasts 17:36. Episode 8 gets a commentary from Kyle Phillips (ADR Director), Dani Chambers (Chise), Jamie Marchi (Script Adaptor), and Brian Mathis (Elias Ainsworth). You also get the textless credits for the show. Really, the episode distribution should have been the other way around, so that the OVA episodes could have fit on disc 2, where they aren’t a spoiler. Just remember to watch them after episode 12, not after episode 5. 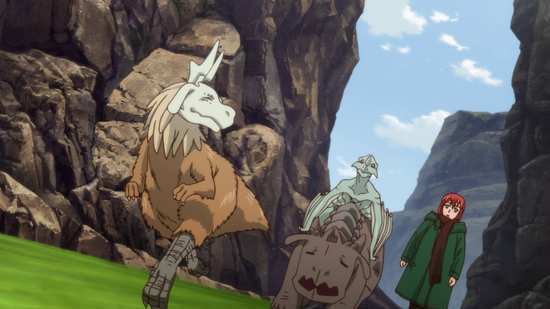 If you want a convenient descriptor, a shortcut to knowing what The Ancient Magus’ Bride is all about, think a cross between Harry Potter and Beauty and the Beast. From the Harry Potter side comes a world of magic co-existing with the modern world, especially a magical world set in England. There are spells, there are strange creatures, and there are plenty of dragons, although this magical world is waning in the face of the technological; the mages are a dying breed. Things which are different include a distinction between magic and sorcery, as well as a greater emphasis on the world of the faeries. 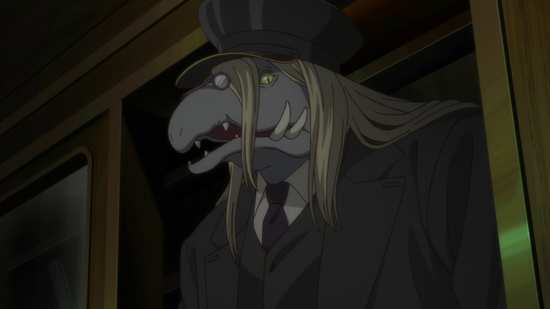 Of course the Beauty and the Beast aspect of the story comes from the title characters, the ancient magus Elias Ainsworth, a tall, non-human character with a horned animal skull for a face, and the beauty, Chise Hatori, a young girl that Elias buys at a magical auction in Japan and brings home to England with the intent to make her his apprentice and eventually his bride too. The story starts from a dark place, and it’s a darkness that resonates through the series, despite the frequent moments of character humour. When we meet Chise she’s depressed enough to put herself for auction, not caring what happens to her as long as it ends her solitude, one way or the other. She’s from the human world, but she’s innately magical, a Sleigh Beggy, a source of magical power, much in demand, and also with the potential of becoming a skilled and powerful mage, but with a truncated destiny because of that. On top of all this, she has The Sight, can see all manner of magical creatures and spirits, which made her childhood a hell because of it, drove her parents apart, and ultimately drove her mother into a suicidal despair. Elias Ainsworth on the other hand is neither human, nor faerie. No one knows quite what he is, except that he is a mage of long standing. 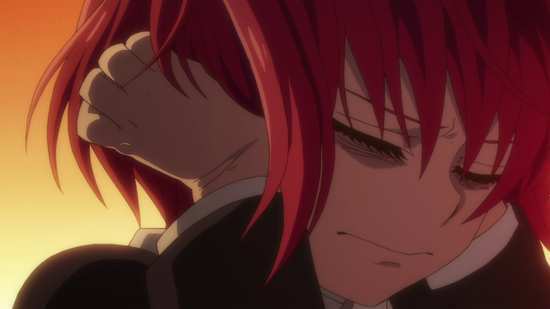 But his humanity is lacking, he’s an outsider looking in on the world, and he’s not quite certain how to relate to people, or Chise in particular. At first, the prospect of possessing a Sleigh Beggy is a powerful incentive, and he approaches Chise like an interesting science experiment. 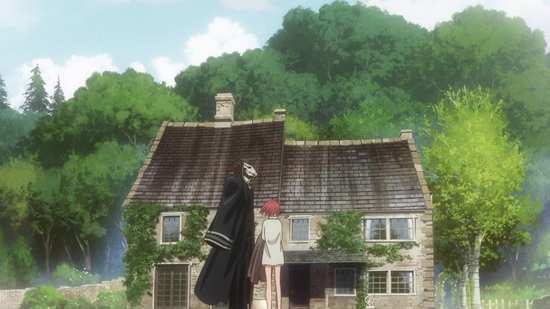 The fact that he is the only person ever to accept Chise, to welcome her into his home makes her accept him and what happens to her as her destiny, even if she can’t immediately trust him other than to expect the worst. Her outlook changes and her confusion grows when he continues to treat her with respect and kindness, which makes it necessary for her to learn more about him and his past before she can actually open up to him. 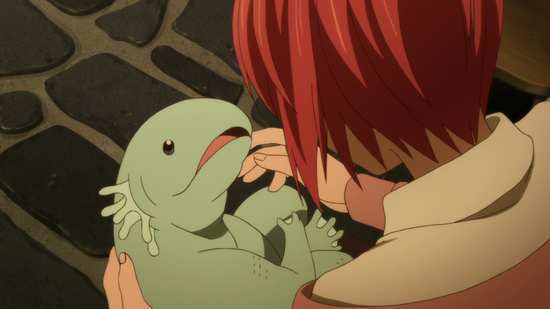 It’s an odd, subdued romance that ensues, as Chise gradually falls in ‘trust’ with Elias, and Elias gradually finds some aspect of humanity awakening inside him, the more time he spends with Chise. The series unfolds at a slow, leisurely pace, following Chise as she becomes Elias’ apprentice. 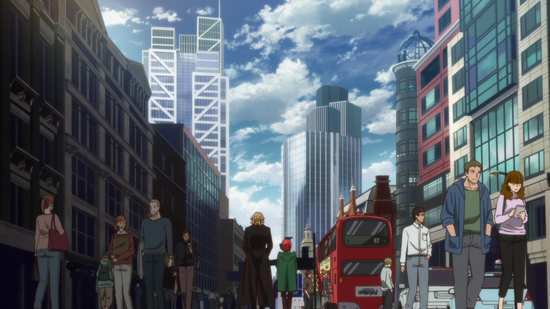 We follow her from Japan to England (in a magical blink of an eye), and see her as she discovers this new world, and is introduced to the magical creatures and characters that surround her, and learns that not all of them were the scary monsters that so afflicted her in her childhood. The series is split into stories, adventures that occur as Elias goes about his business as a mage. It isn’t long before she’s kidnapped by a dragon and taken to Iceland, and the thought might be that it’s someone malicious after the Sleigh Beggy. It turns out to be Elias’ master Lindel, a dragon mage who wants to meet his apprentice’s apprentice, his ‘granddaughter’ for want of another word. Things get more dramatic when Elias is called to a world of cats to deal with a magical corruption, and they run into a couple of questionable sorcerers with dark motives. There is also a story about a black dog, pining away at a girl’s grave that turns out to be more than just a dog. Oddly enough, the most impressive story arc in this collection turns out to be that OVA mini-series, which offers a slice of Chise’s childhood that offers a two-fold tragedy. The Ancient Magus’ Bride sets off at a slow and deliberate pace in this collection which never really comes to life dramatically. But it is really about introducing the characters and exploring this rich, vivid, magical world that they live in. All the pieces are placed on the chess-board during these 12 episodes. It’s fun, entertaining, dark and enthralling to be sure, and there are little sparks of drama, hints and flashes of a larger, and more epic picture, but it keeps its cards close to its chest for the most part. 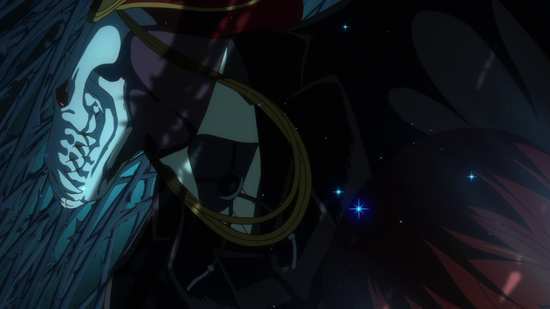 And then episode 12 ends with a preview for the next half of the series, not just episode 13, and it promises that Part 2 of the Ancient Magus’ Bride will pay off in style. I really hope that Part 2 can keep this promise, as the build up in the first half is impeccable.